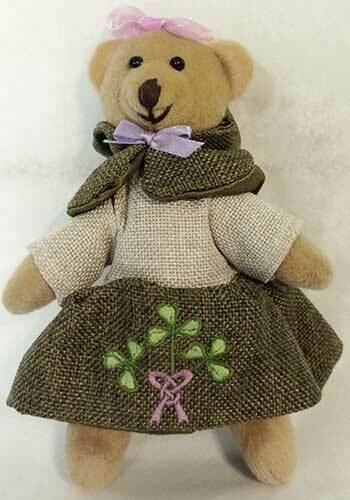 Irish Teddy bear is named Molly and she features an embroidered tweed costume with shamrocks. Sorry, Molly Irish Teddy bear is now sold out. This Irish Teddy Bear would make a great St. Patrick's Day decoration. This Irish Teddy bear is a sweet little girl named Molly who dressed in an authentic satin lined Irish tweed shawl and skirt that is enhanced with embroidered green shamrocks along with a pink Celtic knot. The doll is 100% polyester and stands 7 1/2" tall. This stuffed Irish Teddy bear is made in Ireland by Islandcraft and she is complete with shamrock and Celtic knot history cards, complements of The Irish Gift House. Irish Teddy Bear is named Paddy; he features an embroidered tweed costume. Plush green Irish Teddy bear features an embroidered shamrock on his foot and would make an ideal Irish baby gift.